Features of the phone, writing SMS messages, filling in of phone book etc. Manufacturers put 5 the most often used applications: Messages, Phone book, Phone mode, Calendar and Browser in a tool bar. This bar is displayed in both opened and closed mode. Let's see the opportunities of these applications. The phone book can store up to 1000 contacts depending on memory space. May be it's not much but I think it can satisfy even the most exacting consumer. You can add 8 phone numbers, e-mail address, Web address and a full home and business address to one entry. If it is still not enough, you can add your own notes in a specific text field. It's also possible to associate a small image with each contact. 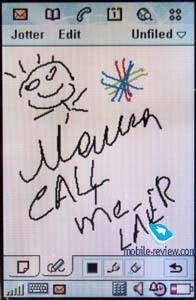 This picture will be displayed while incoming call. 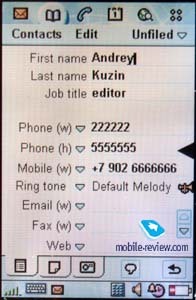 Besides, you can choose any ring tone for any name when you enter an information. 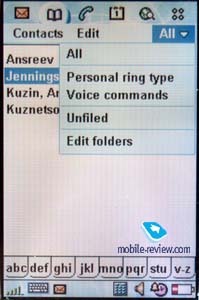 Moreover, there is a possibility to add a voice tag to any of the contact, it will be used while voice dialing. 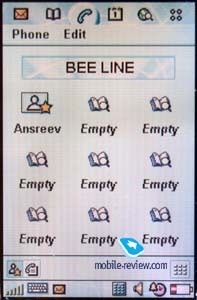 There are different ways to search and to sort the contacts in the phone book. 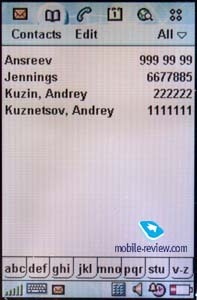 The settings are flexible, for example, there is an option to display a list of names and main phone numbers. So it's the level of good PDAs. Messages. 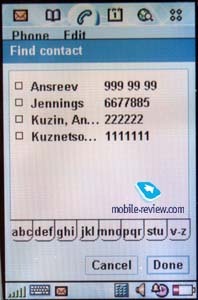 This menu enables you to deal with SMS, MMS and e-mail messages. SMS. Everything is obvious. You can view all your messages in one list, highlight a few and delete them. Standard folders as Inbox, Outbox, Drafts and Sent are supported. 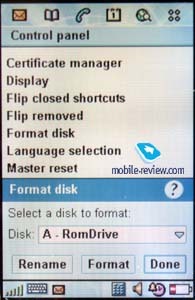 Unfortunately the current version of software doesn't enable to create own folders. Another shortcoming is that already received SMS messages are marked as new ones and appear in the list when you switch off and then again switch on your phone. This fact shows that the feature isn't debugged yet. 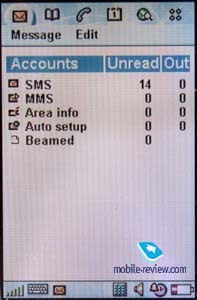 The handset also supports sending and receiving of EMS messages (version 4). MMS. This feature works properly. It is the third phone after SonyEriccon T68i and Nokia7650 which can create MMS messages. The application supports 4 graphical formats (BMP, JPEG, GIF, WBMP) and 3 sound formats (iMelody, AMR, WAV). Also you can attach SMIL files. E-mail. P800 supports such e-mail server protocols as POP3 and IMAP4. It's possible to create several mailboxes. It's disappointing that you can't create your own folders but it's pleasing that the phone support more than 20 attachment viewers (MS Word, MS Excel, Acrobat Reader and others). It's not time to speak about the work of e-mail client yet but those functions that exist today are workable. Phone mode. You need this menu if you want on-screen keyboard to be displayed. 9 shortcuts for quick dialing are also placed here. 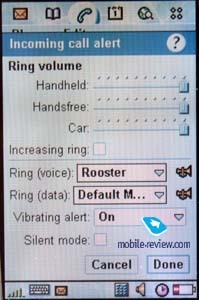 Here you can get an access to the menu settings, setup a ringing tone to incoming calls and turn on a vibrating alert. Don't believe those who contend that this feature is absent in this handset. 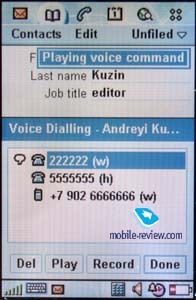 Interesting, that you can use almost any sound file, spaced in the memory of P800, as a ringing tone for your calls. Our experiments showed that large files (more than 150Kb) are not played though you can setup them. 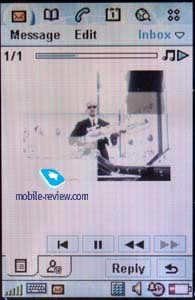 A polyphonic ringing tone is another advantage of P800, the volume is good. You can record not only any melody, but your own voice or other sounds which you like. 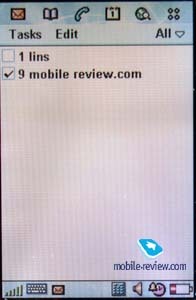 An access to the list of last calls is under this submenu too. 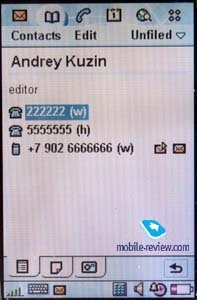 A phone number, a kind of ringing tone (тип звонка?? ), its duration and the date - all this information you can view in the list. It's possible to sort the calls (outgoing, incoming, missed, all). 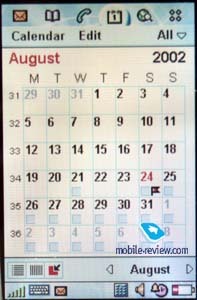 Calendar or organizer. I don't want to describe all the possibilities of this application. 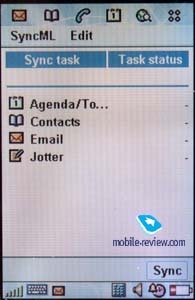 In my opinion this organizer is similar to those in PDAs under PocketPC 2002 control. 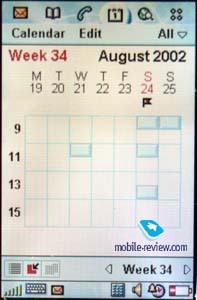 You can view tasks by week, month and day, set repeating events, reminders and so on. Almost all tastes will be satisfied. Browser. I think I won't be mistaken if say that it is the first device on the market that supports WAP, version 2.0. Now you can view not only wap pages but also usual html. In the whole the second version is a big step towards, though there are some limits concerned with the possibilities of small devices. It's no problem to view sites now. It's time to tell about other applications that make the life easier. Let's examine the most interesting ones. To-do list. In addition to an organizer there is a task list: setting priorities, sorting and other features of that kind. Other words it's a handy tool for the work. работы. Jotter. 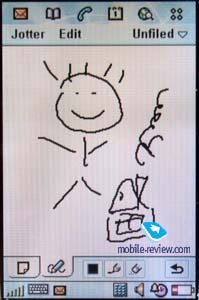 Here you can quickly write text notes, make sketches with a stylus. You are free to choose any tool to draw a picture and any colour for it. Jotter is a little bit simpler by its features than a pre-installed graphical editor. редактор. 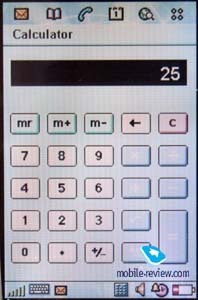 Calculator. It's an analogues to an ordinary calculator. Unfortunately, there is no scientific one. Time. 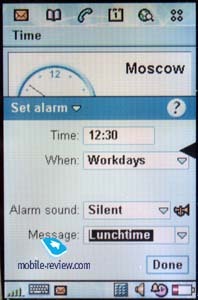 There are not only settings of time and date here, but also settings of several alarm-clocks. They can be set to sound once or in certain period of time. Any sound file is available to use as an alarm-clock signal. Control panel. All settings relating to the phone functioning are collected here: a formatting of memory cards, a changing of screen wallpapers, display settings, changing of system sounds and many others. 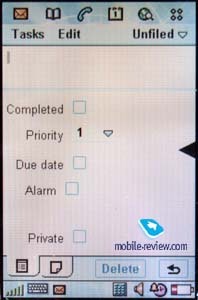 All settings concerning GPRS and bluetooth-connection are also placed here. I checked the work of bluetooth with handsfree HBH-30 and there were no problems. Setup Wizard. 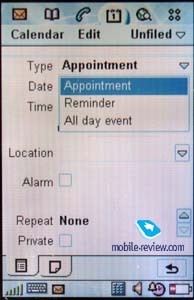 You can initially step by step setup your device, for example to gauge a screen, choose date and time and a time zone. You can know more about the possibilities of the screen. Viewer. It is an utility to view a memory contents and contents of additional memory cards. It didn't work in my sample, probably because of the raw software. Games. 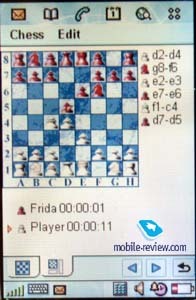 There is a good chess game in P800. 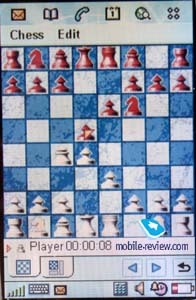 You can set a level of complexity, record your moves. If you are a fan of active entertainments, you can take part in car-races. Graphic is captivated but the battery doesn't live long. I think here we'll finish with the description of the phone's features. Of course there are some other additional applications in P800 but they are not very important. Let me share my impressions with you. I'll try to be short expressing my impressions, they are very different. First of all, the connection quality. 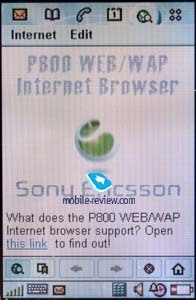 I think that P800 can be compared with other phones from SonyEricsson, no problems. The sound is clear and loud, a maximal volume is enough. The volume level is average when the loudspeaker is turned on, it can be compared with Siemens S45. As for me it would be great to have a louder dynamic in this model. The same is about vibrating alert. It is rather weak, but it's obvious taking into account dimensions and the weight of the handset. It's pleasing that there is a possibility to associate photos to contacts in the phone book. When a person calls you his photo will be displayed near his name. 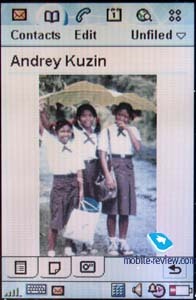 According to the manual guide a phone number is also displayed on the screen, but in reality it doesn't work for the photos of high resolution. 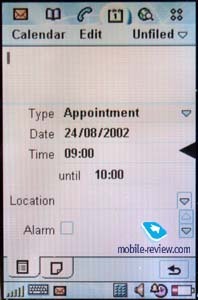 In this case only photos and an indication of incoming call are shown. I used this phone for a few weeks and it seems to me that the best images displayed on the screen are those that were taken with a digital camera in normal resolution and after that downloaded to the phone via PC. The method is easy. Firstly, you reduce your photo (an optimal resolution is of 170x200 pixels). Secondly, you download a received file (in JPEG format, for instance) to P800 and finally, you name the file. Positive points of such method are that you get a picture of high quality but a file size is comparable (or even less) to size of picture taken with an integrated camera. A drawback is that you need time to create a photo for your phone book. 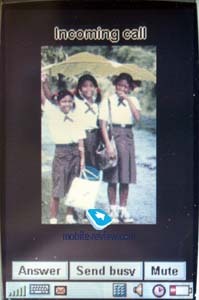 I estimated the advantage of an integrated camera, it can be used in different situations. Recently, I met my old friend who I haven't met for ages. We drank a cup of coffee and he drew a way to his new flat on the paper napkin. But accidentally we spilled coffee on it. Of course I couldn't take it home afterwards. So I took a picture with a help of P800. I could also draw a way in Jotter application but I didn't guess then. I can give many other examples of such situations (sending photos to your friends from the place of vacations, taking photos of furniture to show it to other members of the family and so on). If the other person has such device you can send the photos directly. But that will do for today about camera. Let's discuss other features. 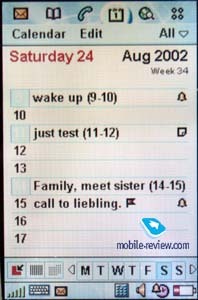 It seems to me that one of the lacks of the smartphone is a list of repeating calls. They can be setup with a help of filters, but the latter are primitive. They are similar to those in Ericsson R380. It would be more interesting if such features as a search by a template, unification of calls by phone number and some other functions of that kind could be used. I hope that other companies elaborate a special software. As for the rest a device is handy. 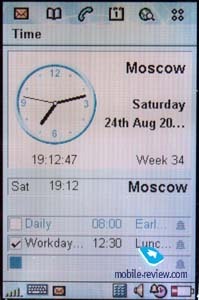 The screen is large as most modern PDAs have, possibilities of as operating system are not bad. 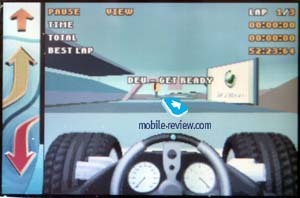 A rate of information output on the screen and a task switching is quite good, usually the delay is less than 1 second, though it can be increased if you deal with power-consuming applications, for example, playing a game Races. 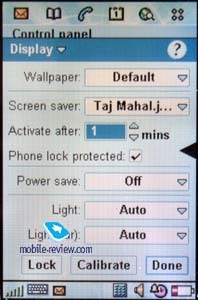 During only one hour a level of the battery power was reduced by more than 50%. A lithium-polymer battery has a large capacity and it causes recharging of 4 hours. It's rather long. I'd like to repeat that if you recharge your phone every day you won't fill any discomfort while using it the next day. A high power consumption is a shortcoming of all devices of this class. So if you need only a phone functions it doesn't make sense to buy this handset. In the whole a smartphone approaches modern PDAs, I think that a distinction between these devices will be eliminated in the near future. Many other multi-functional devices will be appeared and then PDAs will be obsolete devices. At first SonyEricsson planned to launch this model in the third quarter to date to a film Men in Black-2. You can even watch a few trailers of this film on P800. But at last instant the target date was postponed to the December, it was decided to add a slot MemoryStick Duo. Also a confused information, that Nokia 7650 would be launched only in September-October, played a great role. A mass production wasn't started and a base version was easily completed. A slot was placed on the right-hand side under a shutter button. It was also necessary to elaborate a software to support a technical innovation and the delay was because of this. But Nokia launched its model earlier. A market wasn't saturated and though there were no mass sales, it was easy to buy a new communicator. SonyEricson announced that P800 would be launched already in September but later the date was put off. A company desired to launch a completed product. In the end of July a few European operators got samples of P800 to test (someone with and someone without support of MemoryStick). The main differences of these samples is that s phone without MemoryStick has earlier versions of software, doesn't have mail client and some other features. No accessories except a travel charger and a handset itself include in a standard kit of such device. One must be crazy to pay more 1200$ for such product. Small lots of P800 will be appeared before December, a price will be rather high. These lots will be aimed to satisfy a primary demand. Later the smartphone will be a mass product and by the Christmas it will be presented almost everywhere. By that time an expectable price would be about 750 Euro.